Center for Ankle and Foot Care Blogspot: Heel pain is the worst! Here are my favorite pieces of advice for patients suffering from heel pain that I know work from experience! Heel pain is the worst! Here are my favorite pieces of advice for patients suffering from heel pain that I know work from experience! You wake up, step out of bed and then BAM! You feel it, a sharp undeniable pain on the bottom of your foot near your heel. Were you asleep for a hundred years, or did you rapidly age overnight? No, you have plantar fasciitis, most likely. As a foot doctor we see patients with heel pain about 15 times a day. It is one of my favorite problems to treat, because people are always in shock on how easy it is to get better if they just follow some simple instructions. This topic is very close to home for me, because after 2 weeks of a new exercise program P90X3 , I developed plantar fasciitis! The doctor is now the patient! This exercise program is a lot of jumping and up on your heels for different exercises. It is a great program, but I would recommend some extra stretching of the calf muscles before and after to avoid getting plantar fasciitis. Many people find it hard to get into the doctors office, but when your foot hurts it sometimes is unavoidable. If you think you have plantar fasciitis or "heel pain" I would recommend seeing your foot and ankle specialist. But I will share with you what I have done from Friday of this past week, when my pain first started, until today Tuesday, just 4 days later. My pain has gone from an 8 out of 10 Friday morning to about a 2 out of 10 Tuesday morning. other tissues within your feet. Many people develop Plantar Fasciitis from long periods of standing, running, or performing various load-bearing activities. For me it was a new exercise program with a lot of jumping. The most common symptom of Plantar Fasciitis is pain. This can be burning, stinging, stabbing or throbbing pain. Many people experience a dramatic amount of pain when they first get up in the morning, with the sensation lessening throughout the day. For others, the pain is consistent. The pain can be isolated to an area in the middle of foot, or it can radiate outward towards the toes. The heel is the most common area for Plantar Fasciitis pain to show up. 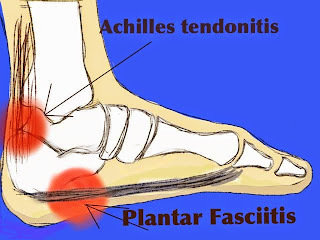 Plantar Fasciitis pain can be very stubborn and last for months or even years. Since walking and standing cannot be completely avoided in our lives, the injury can cause serious disturbances in professional and private life. The causes of plantar fasciitis can be multi factorial, as you can see below. But the anatomy of our lower leg plays a major role as well. If you look at your calf muscle as compared to the front of your lower leg, you will notice a big disparity in muscle size. The back of our leg muscles are bigger because they have the responsibility of pushing our body forward with each step. But the more we walk or exercise with out stretching, the tighter this muscle group gets! Several different things can cause Plantar Fasciitis, which makes classifying the condition somewhat difficult. For example, bone spurs, flat feet, high-arched feet, and hard running surfaces are all very different—but each one can be a cause of the condition. Individuals in professions that require you to stand for long periods of time—nursing, for example—are at a higher risk for developing cause Plantar Fasciitis. Another very common cause of Plantar Fasciitis is the type of shoe you choose to wear. Older or poorly constructed shoes can place your feet at a higher risk for stress. Shoes that don't have adequate padding for the heel and arch can be a problem as well. Finally, overweight individuals are at a higher risk for developing Plantar Fasciitis. As you gain weight, this naturally places more stress on the tissues of your feet, and the fascia tends to bear the brunt of this. People find it hard to believe that stretching, icing and support can be the perfect combo to relieve and help get rid of their heel pain, but it's true!!!! I know from experience over the last 4 days! What I always tell patients when they come into the office with heel pain or plantar fasciitis, is that even though it hurts so darn bad the cure really does revolve around stretching believe or not, in most cases. Sure it can require a medicine by mouth or even a shot with some extra support in shoe gear but it is usually a simple fix. The fix is simple but, depending in how long it takes you to seek help to get better, could be the deciding factor on how long it actually takes you to get better. The sooner you seek care, start the stretching exercises and put good support in you shoes, the sooner you are on the road to recovery. Here are my classic three stretches performed by my lovely stick figure drawings, but simple is always better. 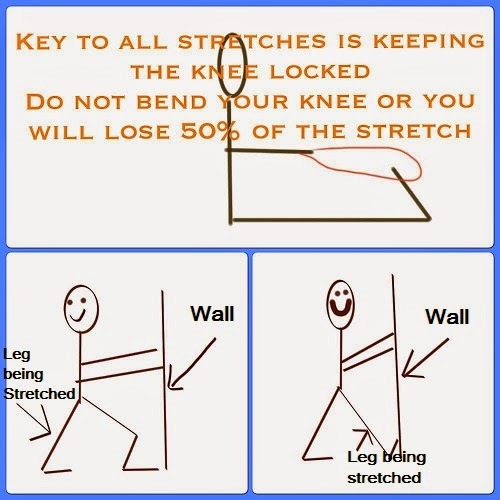 I have done these three stretches 4 or 5 times a day for the last 4 days. 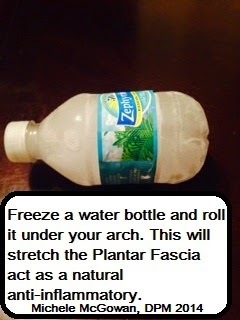 Stretching is important for your Plantar fasciitis to get better and stay away. Yes, that is right, I tell all of my patients that they need to stretch daily after having Plantar facsiitis to prevent it from coming back! These three basic runners stretches should be performed 3-4 times a day when you have Plantar fasciitis. You should stretch both sides for completeness sake and hold the stretch for 15-20 seconds with no bouncing. Icing is another thing I tell people to do when they have acute Plantar fasciitis. But how you ice can be a real key to your success. You need get a little plastic water bottle and freeze the water inside, then take it out 2 times a day rolling it under the arch of the foot back and forth. I tell patients this is like physical therapy without a copay. It is a natural anti-inflammatory and stretches the arch very effectively. I currently have three ice bottles in my freezer and have been rotating the bottles for ice massage non stop when I am home. These are the two main ways to start treating your Plantar fasciitis right now: stretching and icing. They have been the hallmark of my own treatment over the last 4 days. But I also have used the following to help support my fascia while I was standing like inserts and slippers. Also, there is something called a Plantar fascial night splint that I have worn every day for the last 4 days while I was sitting. Some people get home and kick off their shoes and then strain the fascia walking barefoot around the house. Support, even at home has a very positive effect in your outcome and feeling better sooner. Something like a spenco slide or slipper can be a foot saver and is what I have relied on the last couple days to protect my feet around the house. Pain in ankle can cause serious injury if not handled on time. So to avoid serious damage you can use ankle compression sleeves which helps in providing relief, comfort and also helps in recovery of present injury. Build Kho community with other athletes working hard to stay healthy. Engage with healthcare providers that are passionate about working with athletes. Very informative blog you posted keep it up and update us with these new things, thanks. Nice article indeed! Thanks for updating us with your new articles. However, Treatment for Heel Pain from Podiatrists in New York City , is proved to be quite effective for plantar fasciitis.